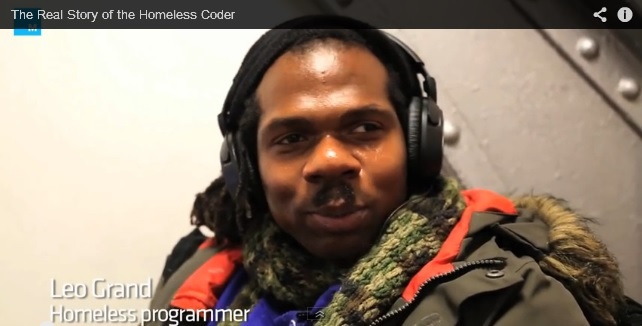 You can learn phrases in English with this interesting interview about a homeless man who was given a choice of $100 or the chance to learn how to code. He chose the second option and created a mobile app in just about 100 days. Watch the video and if you need extra help, you can read the transcript below. Note: Explanation of the bolded words is given at the end so you can learn phrases in English. Patrick McConlogue: So think way back, remember Go code dot JS? Remember how it uses requests (yeah) to make the call (yeah)? You’re bumping out to protons right? (Uh-huh) You’re saying here’s my, here’s my deal with an address. Start address and end address. (right). Patrick: (laughs) Giant chains around two massive rocks. Like half… partially… I told you, it’s partially tragic… yeah, but partially epic. He has an intensity that is … you can clearly see it. So… and I walked by him for five months. And like, there you go, he’s not … game's not over. Leo: Game is not over. Leo: I like to think of myself as, excuse me, as an intelligent person, so I like, I dig the mental challenge. I just, I love it and as a scientist I said, “Something new to learn.” I’m coming out with an app called Trees for Cars, it’s a carpooling app and the main objective is to get more cars off the road. And, plant more trees. Patrick: This is where we used to do the lessons, ah, whenever these were open. uh, we’d just code here or sometimes we coded on the sand bags. And just prop up books and I’ve got a mini travel white board you saw that. Patrick: At the end of October, it was just an amazingly cold set of days and we started to, like, increase the time that we were, we were coding. I noticed that it was just getting really hard to continue to type and I didn’t know my boss would be so kind about it. Without question, totally whatever you need, he’s welcome to have a desk here. Leo: Everybody I know, who I’ve talked to, who wants this app and wants to see the app, they, excuse me, they want to help support. Negative comments or haters, I think they’ll end up changing their mind when this app is completed. Leo: The most painful thing? Leo: That I’m a bum. And I’m homeless. But it’s not painful to me. Leo: I think what you mean to say is, “What’s the most hurtful thing someone can say to you?” That would have to be, “This person is dumb and not intelligent. And not good looking.” (laughs). Patrick: We are seven minutes and 25 seconds from his app launch. Leo: Heyyy, Trees for cars! Yayyy! Leo: It’s available. It’s bam! Trees for Cars! Leo: Trees for Cars is just that. It’s a mobile app about saving the environment, bringing communities together, saving the world, and best part, saving money in your pocket. Leo: This would change my life where I can work at Google, I can work at SpaceX, I can build a server. This is going to change my life in a magnificent way. Leo: Trees for Cars. Trees and boats. Patrick: You know I didn’t actually know, I didn’t know what the name meant until like a week ago, what it actually meant. Creating a tree for a car. I just thought, huh, that’s a weird name. Patrick: It has been extremely difficult. Just a ton of work. Very hard. Lots of different challenges that I did not see. But it is by far the most rewarding experience of my life. It encourages responsibility. There are a lot of people who can do a lot of great things and I think that sometimes, that potential could be lost. here's my deal: here's my situation. In this example, a person using the app would use here's my deal to mean: "I am in this situation: I'm at this address and I want to get to this other address." take a break: to have a short rest. a hundred bucks: In American English one buck is one US dollar. door number two: This refers to an American television game show, Let's Make a Deal (and a probability puzzle) where contestants choose between three closed doors that have prizes behind them. game's not over: Game over is a message that is shown at the end of a video game and is used in conversation to mean something has come to an end. Here, Patrick says he saw Leo exercising with huge chains and rocks and so he knew that he had not given up on life (the game was not over). I dig the mental challenge: to "dig" something is to really like or love something. carpooling: an arrangement between people to drive somewhere in the same car. In this situation the app matches people who don't know each other to travel together. a bum: a person without a home or regular work who wanders from place to place and lives by begging. a ton of work: a is a great amount of something. (A ton is a unit of weight equal to 2,000 pounds). As you can see, it's easy to learn phrases in English. You can learn them with magazine or newspaper articles or you can find many videos that have transcripts so you can listen to how the words are pronounced and read at the same time. To learn phrases in English it is very helpful to keep a notebook with the phrase used in a complete sentence. If you can, print out the article or tear out the story or article from a newspaper or magazine. Underline or highlight the phrases in the article. Then write these new phrases in your notebook with an example sentence. Review your notes frequently. 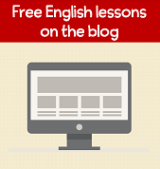 Return from this learn phrases in English lesson to homepage or video directory page.